Math Gadgets™ is jam-packed with 19 gadgets containing over 34 different math concepts. It works with most problems right from your homework or Math textbook. 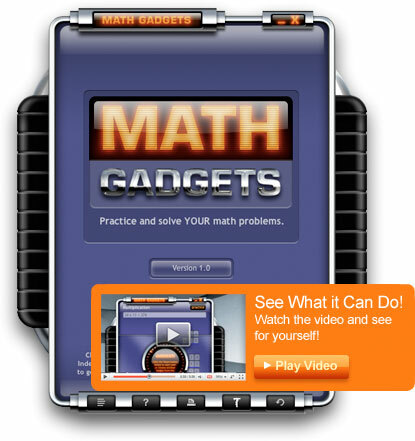 Math Gadgets™ is a new kind of math program. It offers assistance for problems when the teacher is unavailable. It provides guided independent practice. It's perfect for classroom independent practice. Based on Dataworks™ research, It stops the student from repeating and reinforcing the same mistakes. Math Gadgets™ gives instant feedback about errors being made when they are being made. No more frustration doing long, complicated problems, only to find out later the answer is incorrect. Math Gadgets™ can be used to correct homework. Students will know exactly why an answer is incorrect. Every homework problem showing every step can be printed out beautifully. Every answer will be correct. And you can be sure there was no cheating because calculators are unnecessary and cannot be used. Math Gadgets™ is intuitive and easy to use. Written instructions are brief and usually not necessary. Each gadget comes with a video tutorial right next to each gadget. It helps students from kindergarten to middle school. It works with very simple to very complex problems. It will never be outdated or obsolete. Students will always need help with basic concepts like division, multiplication, factoring, and measuring. It's written by an actual classroom teacher, Max Schafer. He uses it in his own classroom. Math Gadgets™ has a basic facts tester for all 4 basic operations. Each test is timed. All problems that are entered with the incorrect answer are appended to the end of the test, requiring the student to re-practice only the problems they do not know. Math Gadgets™ comes with "Primary Math Gadgets”, (for kindergarten - 2nd grade) the award winning “Fourth Grade Math Practice” and “Fifth Grade Math Practice”. Both programs come with hundreds of problems. Each Math standard is repeated over eight weeks, to ensure the concept is remembered into long term memory.